Every morning at half-past six, I make a cup of coffee for my wife, using a device known as an AeroPress. Simplicity itself, this device consists of a plunger, a cylinder, a paper filter, and a perforated cap. To brew a cup of coffee, I place the AeroPress on top of a mug, pour the prescribed amount of freshly ground coffee into the cylinder, and add a small amount of hot water to release the flavor. Moments later, I add the full complement of hot water, insert the plunger, and press down. If I press too hard, I will encounter formidable resistance from the volume of air trapped between the plunger and the coffee, and the AeroPress won’t work. But if I press gently, with virtually no effort, the plunger will go down smoothly, emitting an audible sigh as it reaches the bottom. Almost always, the result will be a delicious cup of coffee. I first heard about the AeroPress from a friend and fellow Zen practitioner, who also makes morning coffee for his missus. That is perhaps no accident, because the skills required to operate the AeroPress resemble their counterparts in Zen meditation. Both the AeroPress and the practice of Zen require balance, patience, and steady attention. Beyond that, both enlist the kind of energy known to Taoists as wu wei, or “effortless effort,” whether the object of the effort be the breath, the contents of the mind, or the situations encountered in everyday life. Press too hard, and you will fail. Press lightly, aligning yourself with natural forces, and you will allow the desired result to occur. Most meditative practices begin with attention to the breath. Some schools of meditation, including Zen, advocate the counting of breaths in general and exhalations in particular. Others employ such words as “in” and “out” to track the process of respiration. Whatever the method, however, many people find it difficult to observe the process of breathing without attempting to control that process or bring it into conformity with an imagined ideal. To counter that tendency, I have found it helpful merely to listen to the breath, as the Zen-trained teacher Toni Packer advises, rather than employ an analytic method. In the same spirit, one can view oneself not as the owner/operator of one’s breathing but as the one “being breathed,” both by one’s body and by the life force common to all living beings. Approached in this way, the breath becomes an object of interest rather than willful concentration. Turning from the breath to the contents of the mind, the same quality of attention may be applied. In his essay Samadhi of the Self, the Soto master Menzan Zuiho Zenji (1683-1769) defines the contents of the mind as “emotion-thought,” which he views as “the root of delusion; that is, a stubborn attachment to a one-sided point of view, formed by our own conditioned perception.” The purpose of zazen, or sitting meditation, is not to suppress thoughts, as some would have it, but to clarify “how emotion-thought melts.” Through the regular practice of zazen, “the frozen blockage of emotion-thought will naturally melt away.” This will occur not through cutting off thought, a practice Menzan likens to cutting the trunk of a tree and leaving the root alive. Rather, it will occur through effortless effort: through mindful observation of self-centered thoughts and their emotional subtexts. The equivalent of a gentle hand on the AeroPress, such observation serves to illuminate the roots, the dynamics, and the consequences of ego-centered, prejudicial thinking. Over time, it can thaw the frozen block of emotion-thought. But can that degree of awareness, attainable within the confines of private meditation, be sustained within the arena of everyday life? Can it withstand the violence, physical and verbal, of contemporary culture? In his address in Tucson on January 12, President Obama invited us to ask ourselves whether “we’ve shown enough kindness and generosity and compassion to the people in our lives.” He also asserted that “what matters is not wealth, or status, or power, or fame” but “how well we may have loved.” Those are stirring words, and they rightly locate the nexus of non-violence in immediate, human interaction. At the same time, they remind us of the centuries of negative conditioning—the monumental blocks of emotion-thought—that must be addressed with awareness, if the President’s vision of a kinder society is to be realized. Given present conditions, that may seem a Herculean project, requiring nothing short of a social and spiritual revolution. But such a project can begin with an effortless effort, which is to say, with a clear and intimate awareness of what we are about to say or do in this very moment. Living in that awareness, we can ask ourselves whether what we’re about to say is necessary, true, and kind, and whether our words and actions are likely to be hurtful or harmful. And we can speak and act accordingly. *Menzan Zuiho Zenji, “Jijuyu-zanmai” (“Samadhi of the Self”), in Shikantaza: An Introduction to Zazen, edited and translated by Shohaku Okumura (Kyoto Soto-Zen Center, 1985), 106. 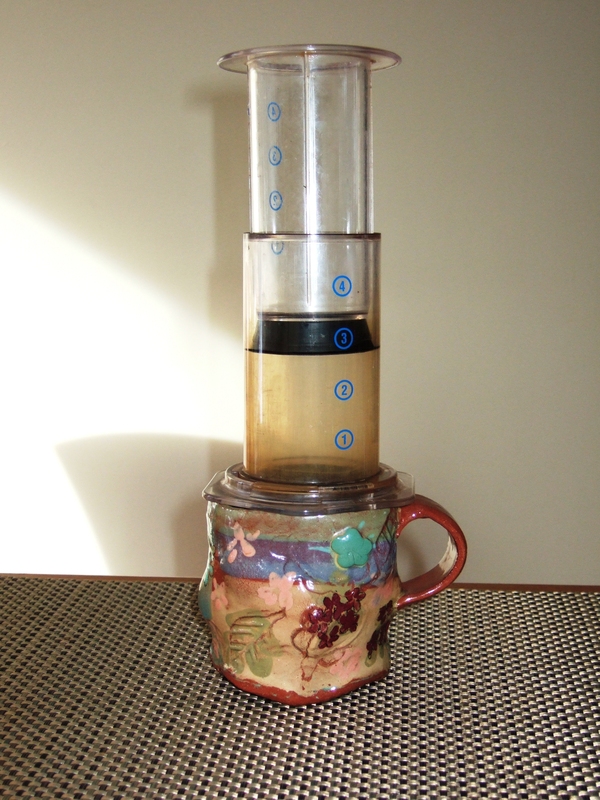 The AeroPress was invented by Alan Alder in 2005. For more information please see http://en.wikipedia.org/wiki/AeroPress. In the photo above the AeroPress rests on a cup by Robin Caster Howard. Thank you for sharing the teaching of Menzan Zuiho Zenji – quite lovely. And from my own self-study, quite true: emotion-thought. I’ve been interested over the last couple of years in the fabrication of emotion-thought (this was the Buddha’s view – that emotions and thoughts were fabricated (as in “made”)). This contrasts with the common view that emotions are phenomena that wash over us without any agency on our part. Thank you, Ben, for your comment yesterday on Ox Herding. I look forward to reading a few of the writers you mentioned who are new to me. Very generous – thanks again! I shared this with my Technology, Culture & Society class after a Swiss student told of her attachment towards her coffee-maker! Connecting our machines and tools with those whom we love and care for and nourish expands our insight. Sustaining that “mindful consumption” about which Thich Nhat Hanh wrote in a recent post attached to your e-mail sitting list similarly inspires me to practice more, bit by bit.